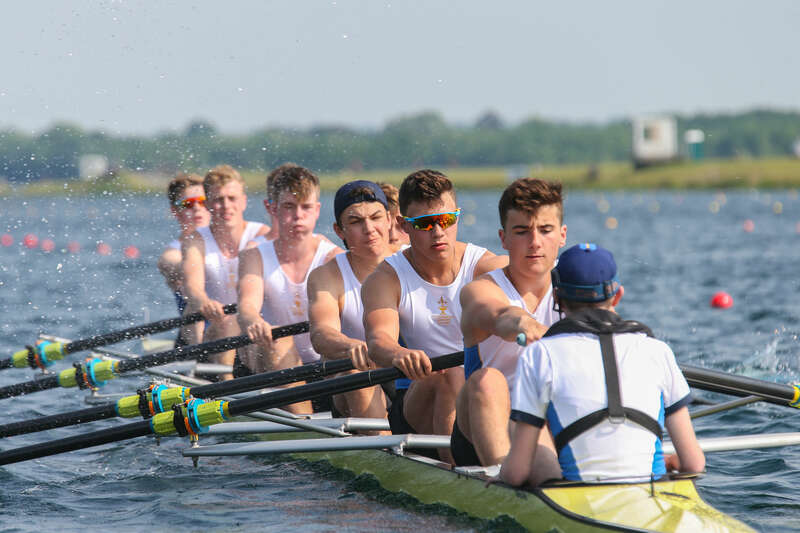 The Boat Club entered the 2018 National Schools Regatta with thirteen crews ranging from the J14 B Octo up to the 1st boys VIII and 1st girls double. All got through the time trials to reach a final, coming away with two sets of medals (Gold and Silver) from 5 A finals, 3 B finals, 3 C and 2 D finals. All results, crew names and some video of the racing can be found here. Friday, which is for the J14 and J15 crews, arguably provided the most dramatic and ultimately successful racing for the Boat Club. For the J14s it was their first major competition and they handled it all superbly with their best sculling to date. From both Shell boys and girls a quad was selected as the top boat and neither disappointed in very high standard fields with a significant amount of the opposition far more experienced having sculled for years and not just months! The boys quad were the second fastest school crew from an entry of over fifty boats and finished fourth only a few seconds away from a medal. 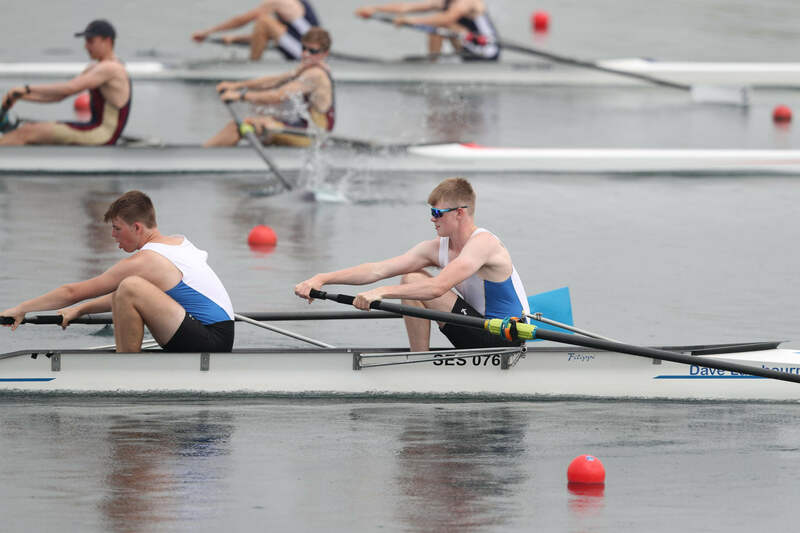 Records are hard to come by, but this is the highest finish position for a J14 boat at National Schools Regatta, at least in the past 20 years. The girls were also fourth from a field of over fifty crews but in the B final, ranked tenth overall and the third highest ranked school crew. The Octuples are always fraught with danger and suspense, but all three boats were brilliant in how they handled the event, themselves and, in the racing, their sculls. The boys A boat won their D final leading from early on and hanging on under pressure in the final stages to win by less than a second. The girls were also in a D final which they won (ranking nineteenth) coming through from third place at the halfway mark. 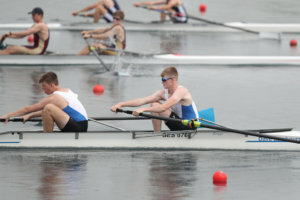 The boys B boat got stuck in to their C final coping well to finish fifth with an overall ranking of seventeenth. Also racing on the Friday were the Fourth Form girls in the J15 coxed four. They ranked 5th in the time trial and in the semi had a storming first half before being rowed through by the favourites, Henley RC. 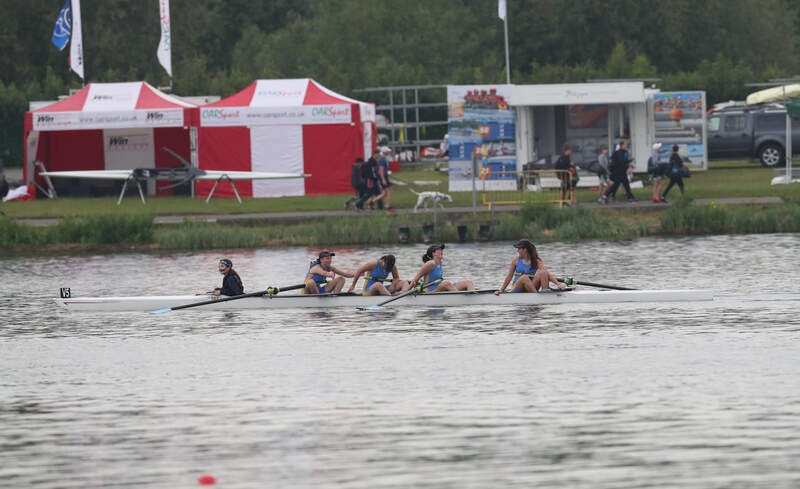 Wise words from coach, Katie Greves saw a better paced A final and on the line, placed second in a photo-finish before a complaint from the Henley crew was upheld and a re-row scheduled at the end of the day’s racing. With four boats contesting three medals, all was still to play for and a real test of courage and nerves. Again, steady pacing saw them third at half way before a fantastic and fastest second half got their bows in front almost on the line to win the gold medal by 0.24 seconds. This is the major day of racing with all of the eights contesting medals. For Teddies this included the boys J15 and 1st VIII. 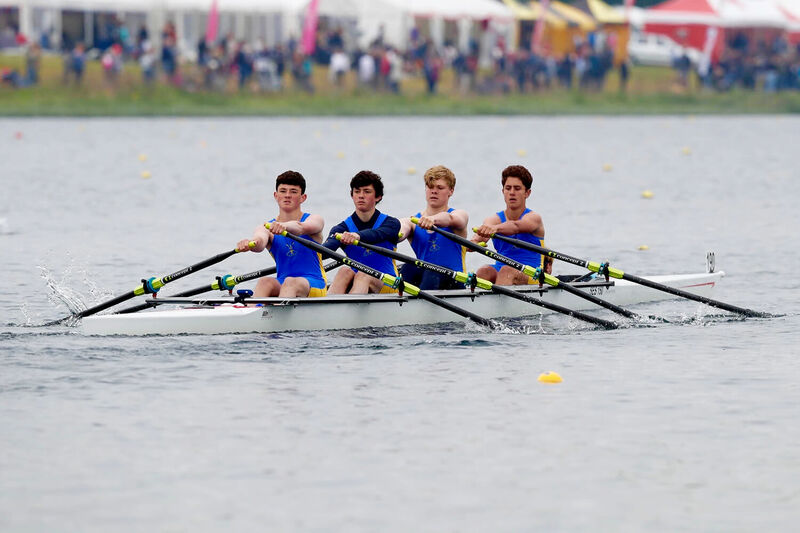 Each had a time trial and then semi-final but for the J15s this exposed an illness within the crew leaving them trailing in the semi and ultimately unable to continue to race their final. Nevertheless this was an impressive performance by the boys from twentieth at the Schools’ Head to eleventh at National Schools Regatta, ahead of Eton and Radley. The 1st VIII were ranked seventh in a very close time trial where only one second covered third to eighth places. With an increasingly strong cross-head wind, competition for lane draw was crucial as this can have a major impact on race outcomes. A close tussle with Latymer ended with Teddies (in the more disadvantaged lane) qualifying but in fourth place. A Lane seven draw for the final all but put paid to any chance of a medal and again we found ourselves scrapping with Latymer (lane five) in the closing stages. Overall seventh ahead of Shrewsbury, Abingdon and Hampton showed, as for the J15s, a big step on from the Schools Head though, like all others, some way off the winners, St Pauls. The senior girls raced in a coxed four and due to restrictions on entries, a double scull for our senior girls Maddie and Matilda. This was a very tough event where they did well to reach the C final, finishing third and an overall ranking of seventeenth but fifth of the school entries. The Fifth Form/Lower Sixth coxed four raced well in the time trial to finish tenth but in the semi finals were one place outside of an A final. With delays to racing, an insurmountable travel issue forced a replacement bringing in girls’ Captain, Matilda (after her two races in the double). They finished well, second in the B final. A quieter day for Teddies with only the boys from the VIII racing in pairs and fours but no less successful with two A finals and one set of medals. 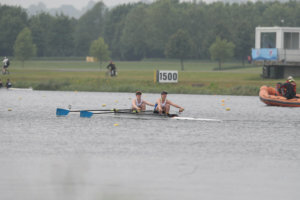 The bow pair of the VIII, Valentin and George did an excellent job to qualify for the C final of Championship Pairs in eighteenth from 33 entries but then rise another four places to finish second in the final. 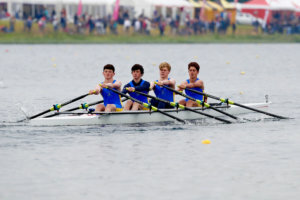 The Championship four (Campbell, Max, Nicola and Barnaby) were fifth in the time trial and third in their semi to get into the A final where they finished strongly but just outside the medals in fourth place. 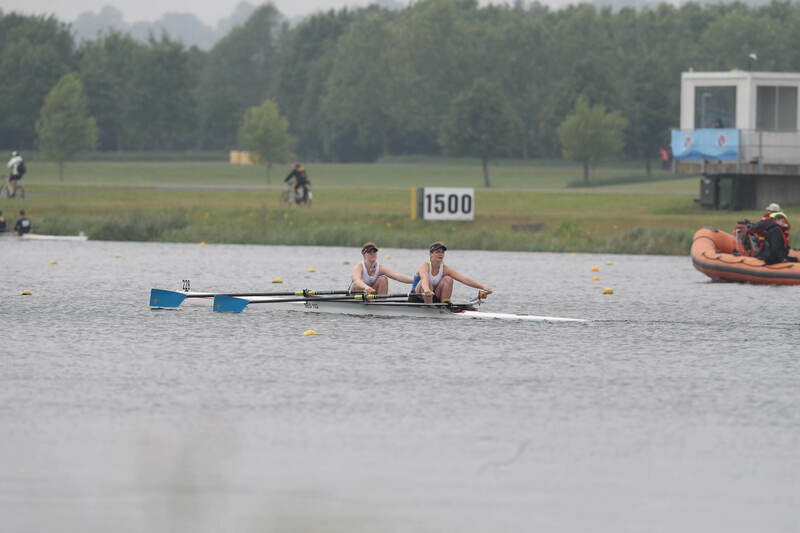 Before this the youngsters of the VIII, Thibby and Alex had the opportunity to race in their age group in J16 pairs. The route to the A final was via a modest tenth in the 8am time trial followed by second in the semi and after swapping places with Walton RC, rowed through in the final 250m to secure the silver medals. The support from parents was extensive and the weekend much enjoyed, not least thanks to the contribution from our wonderful Catering Department who were on hand both Friday and Saturday. The hard work, skill, enthusiasm and inspiration from the coaching team of course provides the opportunity for the pupils to train and ultimately perform to their best level. The tireless input from coaches and boatmen over the weekend kept everything moving in the right direction and is much appreciated by all.